Network, Grow, Network Some More! Does your book club host literary events or are you planning to do so in the future? If your answer is yes, have you begun to think about how you will fill the audience, and if you are selling tickets, how you will find people to buy them? This is not easily done! I am the founding member and President of The Reading Divas Book Club of the DMV (DC/MD/VA). In 2008, we decided to celebrate our 10th anniversary by hosting our first event, a “Literary Brunch”. We had a keynote speaker, 9 authors “were” the Author Expo, and there were about 90 in the audience. Six years later, that event has grown into a two-day event that we now call “The Black Authors & Readers Rock Weekend”. In 2012, we had a keynote author, several featured authors, a 25-Author Expo and about 250 in the audience. Based on the steady increase in our audience size and how quickly the Author Expo sells out, it’s clear that we’ve created an event that people love and support but this growth also forced us to develop a plan to take the burden of ticket sales off the members. We’ve had a website and Facebook page for several years, but these things combined with word of mouth and requiring members to sell tickets only goes so far. Everyone doesn’t enjoy selling tickets and even members who love the event can become tired. Of course I would love to have several corporate sponsors and a budget that would pay for radio time and print ads, but since that hasn’t yet happened, I’ve had to look at other ways to market this event. I have stepped up our Facebook presence and ask all of the participating authors to add the event to their on-line calendars, promote it on Facebook and share it with their fans. I place ads in literary publications and in the programs of other book clubs when they hold events. I no longer sit back and smile and hope someone will recognize me, I introduce myself and find out what is happening that I can attend and I share what I'm doing! At one time I thought that hosting several small book signings during the year would be helpful to promote our main event, but attendance at small gatherings has really dropped off. As I continued to look for avenues, I realized there was no shortage of literary events being held, so instead of spinning my wheels trying to host more events, I decided my time would be better spent attending and networking at events that were sponsored by other clubs and groups. I also invited other book clubs in the immediate area to join together in a consortium that would allow us to share information, and I asked other Club Presidents if I could attend one of their regular meetings to share information with the entire club. In other words, I started networking on a different level. Once I realized how powerful networking is in this process, I began to look at how I could improve and “step up” my networking skills – how I could perfect the art of getting to know and touch more people in order to extend my reach and accomplish my goals. I needed to continuously add to my circle of friendly “go to” people, and actually form a mutual admiration society with others who are willing to share information in order to help each other succeed. Because my background is in sales, I decided to revisit two essential networking components: The 1-minute commercial and the short bio. “Hi, My name is Sharon Lucas. I am an avid reader and the President of the Reading Divas Book Club. Since I retired, I’ve become an advocate for all things that bring awesome African American authors, book clubs and avid readers together. If you enjoy reading and meeting new authors, you might be interested in attending The Divas fabulous annual literary event – The Black Authors & Readers Rock Weekend” (as I hand them a business or rack card)! Of course I tailor my commercial to the circumstances and then bridge to other pertinent information such as where the person lives, if they are in a book club, how many members are in the club, if they would like to join a club, and if they host a literary, when/where that event is held. A 1-minute commercial is an easy, no cost way to get your message to more people. You can start developing your own commercial by making a list of those things you want to sell about yourself or your club and develop a short paragraph. Once you’re written your commercial, practice and memorize it. Practice it aloud in front of a mirror or ask someone to listen and critique it for you. Then use it! A bio is a little more complicated but it’s essential that you have something in writing to hand people when appropriate. According to my research, a bio is considered the hottest thing since sliced bread because it is useful for many reasons such as applying for a job, publishing an article, blogging, networking, etc. Club Presidents, you need a bio! It’s a GREAT vehicle for quickly communicating who you and your club are and what you do - in writing. It is not a resume! You might need to develop several different bios depending on your purpose for writing it. A short bio might only be a few sentences; a full bio shouldn’t exceed one page. Follow these few simple rules and you’ll be done in a jiffy. Identify your purpose and audience – know whom you’re writing for. Narrow your information – keep it concise. Write in the third person – this is optional. Start with your name – assume that the people who are reading know nothing. State your claim to fame – what are you known for? State it up front and quickly so the audience doesn’t lose interest. Mention your most important accomplishments – if applicable. Include a personal detail – invite readers to care about you. Include contact information – this is usually done in the last sentence. Aim for at least 250 words – give the reader a taste of your life and personality without boring them. Proofread and revise! Keep it up-to-date! In 1998, Mrs. Lucas founded the Reading Divas Book Club and since her retirement has found her “dream job” - working fulltime as an advocate for African American book clubs and authors, with a particular interest in local emerging authors. She is the driving force behind the “Black Authors & Readers Rock Weekend”, an annual event, which draws an audience of more than 250 avid readers and authors from as far away as California, Florida and New York and all points between. Recently, the Howard University Book Store (HUB) agreed to be a partner by joining the event as the official bookseller. During the 2013 National Library Week, Mrs. Lucas was invited to partner with the Prince George’s County Library system and presented the workshop “How to Successfully Start and Maintain A Book Club”; she also hosted two author interviews during the 2013 Baltimore Urban Book Festival. You can stay abreast of literary happenings in the DMV by checking out Sharon’s blog – www.realdivasread.com and contact her at thereadingdivas16@gmail.com. She is available to assist you to as you start and organize your book club.Her trademark is a prompt reply to all inquiries; her favorite saying is “Real Divas Read”. A retired human resource and sales professional, Mrs. Lucas resides in Bowie, MD with her husband David, who is also retired. I mention my husband in this bio because he was the one who opened by eyes to missed opportunities. One day we were attending a book reading and someone asked me for a business card – when I couldn’t find one in my purse he quickly produced one from his wallet and explained “I’m her manager”. And indeed he is an integral part of my circle. Every day I am reminded of how important networking is. It was through networking and supporting literary events sponsored by other book clubs that I was invited to join a group and attend Book Expo America for the first time, the reason I was invited to be a host interviewer at the Baltimore Urban Book Festival, and why I was asked to develop a workshop for the County Library System. It didn’t hurt that while doing so, I met new people, added to my network and was able to share information about the Black Authors & Readers Rock Weekend at each of these events. Recently, an author who is new member of my networking circle, invited me to assist her daughter's foundation by being part of a panel of judges who would interview candidates for the foundation's annual pageant and scholarship awards. The foundation advocates against domestic violence and awards deserving young women scholarships to Howard University. I was honored that she thought of me. Their invitation included a request for me to forward a written bio and I quickly did so. When the panel convened, I showed up with business cards and flyers for all of the upcoming literary events in which I am involved and when the opportunity presented itself, I gave them to the other panelists. Why? Because it’s my job to continue to widen my circle and help fill the audience of the 2013 Black Authors & Readers Rock Weekend! 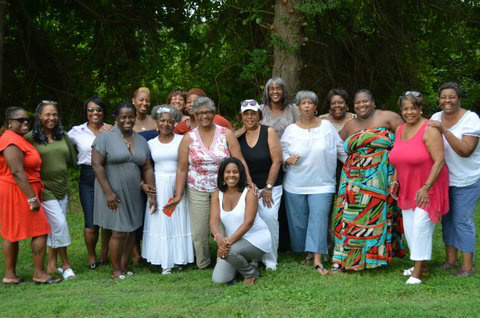 If you're wondering about the picture - it was taken in my backyard this summer, when The Reading Divas hosted members of the Sugar & Spice (NY), Page Turners (Baltimore), and the PC Sisters (DMV) book clubs in a joint meeting. We reviewed "Order of the Seers" written by Cerece Rennie Murphy and Mrs. Murphy was there for the discussion! It was GREAT!!! This is networking!!!! I hope you are already part of my networking circle, but if not, now that you've read this post I hope you too will join my circle by purchasing a ticket to The 2013 Black Authors & Readers Rock Weekend - be sure to do so today at www.readers-rock-2013.eventbrite.com!